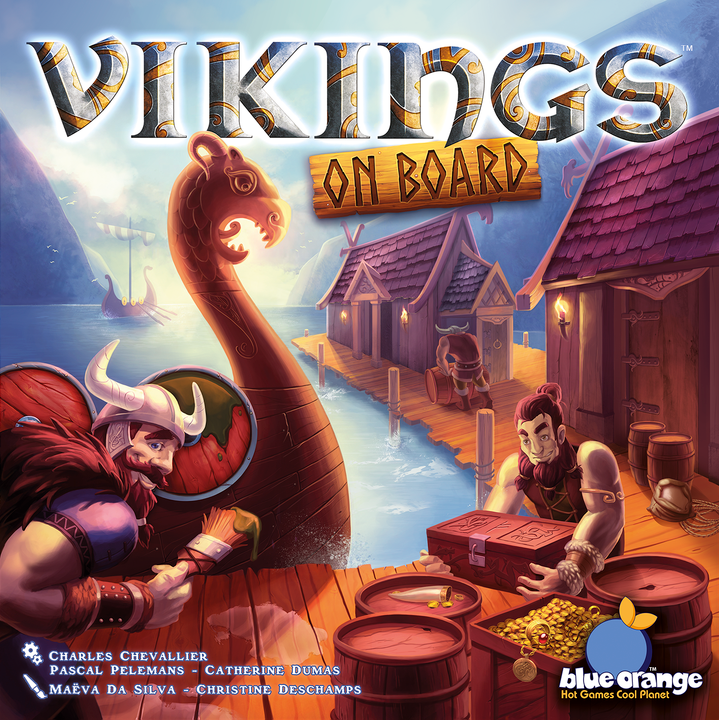 Vikings on Board is a game all about getting ready to go raiding. You need to get your fierce clan warriors on the best supplied longboats before they set sail. Or be sneaky and bet on who will do the best. So grab your drinking horn and prepare to go on a glorious viking raid. What is Vikings on Board like? In Vikings on Board you can score points in two different ways. By making longboats depart from the harbour and by betting on other players success. Each player starts with a couple of workers. You each take turns placing one of your workers on one of the 11 village action spots, that is not already occupied. These actions vary a lot, and they are arranged from least powerful at the top, to most powerful at the bottom. The more powerful an action you take this turn, the longer you’ll have to wait to place your worker next turn. Only 1 of these allows a longboat to set sail. When a longboat sets sail from the harbour, the player who has the most shields on that longboat will get first pick of the supplies on it. These supplies will be worth points at the end of the game. If more supplies remain on the longboat, it will be the player with the second most shields on that longboat that will pick, and so on. So you want to make sure you have the most shields on a longboat when it set sail to score points. You do this by manipulating the different longboat pieces using the village action spots (there are 4 different spots that allow you to do this). The supplies you get of the them are worth only 1 point at the start of the game, but one village action spot allows players to increase the point value of 1 of the 3 different supply types. The last way you can get points during the game is by betting on certain players having the majority of shields and certain longboats when they set sail. This is again done by placing your worker on one of the village actions spots. Players can bet 1-4 points (in secret). So if you get it right it can score you a lot of points. 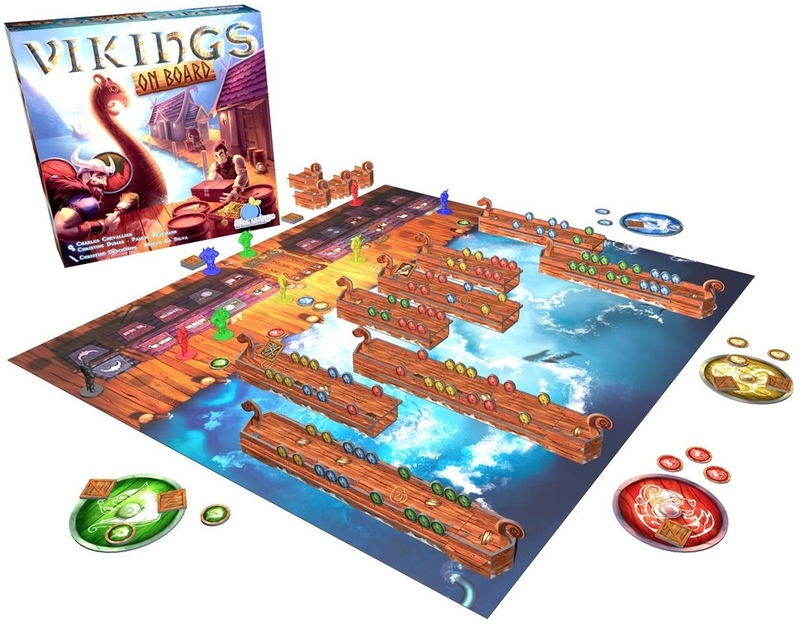 When 7 of the 8 longboats have set sail, the game is over, and the player with the most points is the winner. I’ll be honest with you, I did not enjoy this game. I’m not saying it’s a bad game just that I did not have much fun playing it. I do however think it’s a good game for families. It’s also a good game to introduce new players to the concepts of area majority and worker placement. It’s a highly interactive game that can be very mean and can feel very puzzly. Both things that are fine in most games. But I feel it just doesn’t work that well in Vikings on Board. While the game does have great art and very nice components, the theme feels very thinly pasted on, and it could have been anything really. The components and art are actually the main reason why the game got a rating of 3 / 6 (and not lower). So if you are looking for a very pretty and well produced family style game, and you like the viking theme, I would give this a try. Vikings on Board has a pretty simple set of rules and a clear goal. While it does have 11 different “village actions” they all share a lot. There is also no deeper or hidden strategy to the game.